So, Jeremy Hunt’s suggestion that Lewisham, Somerset, Gloucestershire and anyone other council that wants to cut down on costs can give branches to volunteers and still meet it’s statutory responsibilities has led me to wonder as to what actually is statutory. It is not clear from the Brent case and no other legal case, to my knowledge, has so far settled the issue. My thoughts are in the bullet points below. Campaigners up and down the country (and, it seems, the Secretary of State) need clearer guidelines. Can anyone provide them? For, if Jeremy is correct, library authorities effectively become unprotected by law. the service must be free at point of use (in terms of both membership fee and loans). there must be a service level agreement with the local council. the council must fund at least a significant part of the service, although staffing might be voluntary to some extent. Such funding may be in kind (providing the building, books, lighting, computers etc). the council maintains ultimate responsibility for the library and is thus legally liable for insurance purposes as well as under the terms of the 1964 Public Libraries and Museums Act. This may include sub-contracting the service to a community group (in the same way that the service in Hounslow is still statutory although run by a private company). “CILIP’s position is clear”, she states, “If community managed libraries are to be regarded as part of the statutory service they must have a core paid staff, be part of the professionally led public library service and operate within a service level agreement with that parent library service. Volunteers play a valuable role in enhancing the public library service but they are not a replacement for the skills and expertise of staff. All are entitled to a public library service of high quality”. Annie Mauger, Chief Executive, CILIP (librarian professional body). all 14 by 50%. All will remain statutory” (p.10). This means that at least one (albeit recently defunct) influential body thinks that the 1964 Act still applies if (a) the branch is managed by volunteers and (b) it’s funding is halved. Similary, it says Cambridgeshire will “community partner” another 13 “which will remain statutory”. So, it is not black and white…. and politicians like Mr Hunt love grey areas. They can hide and shade into them so well. Library map – Children’s Laureate. “Julia Donaldson will making visits to public libraries all over the UK a special priority throughout her time as Children’s Laureate.” Map produced showing the libraries she is visiting. Scottish Borders – Consultation on reducing Innerleithen Library hours extended. Yorkshire Libraries and Information – Music and Drama Service may close . Campaign group – Making Music. Barnet – Campaigners hand Barnet Council proposals to keep library open – Times series. “Last Friday seven campaigners met with council officials to demonstrate not only how Friern Barnet Library (FBL) could be used more effectively but also the huge support it has from community groups including the Royal British Legion and Age UK Barnet. Their proposals suggest FBL offers volunteer-led projects alongside council-run services such as IT training and support, health clinics as well as inter-school reading groups and story-time clubs for nursery children.” … “What councillor Rams has actually done is threaten to close the heart of a community unless they “make it worth his while” to keep it open. It’s not my ideal picture of how Barnet council should treat residents!” (comment). Hillingdon – 5 years of the Hillingdon Library project – Good Library Blog. “We had learned that – contrary to almost all of the advice received from elsewhere- what really mattered to the public are the stock of reading material; the design of the buildings to make them attractive, interesting, convivial and useful; the opening hours and the ability of the staff to be helpful, friendly and knowledgeable. 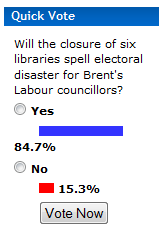 It was clear that if those were done properly an awful lot of people would use the service, more than were using the rather desolate library buildkings that existed at the time” … “The councillors have realised that a good library service is actually a vote winner- it has become one of the most talked about achievements of Hillingdon council”. Improvements do not need to expensive and efficiencies could mean no need for library closures. Isle of Wight – New self service kiosks go live – Isle of Wight Chronicle. “Initially the new machines will be installed in the two busiest Island libraries – Ryde and the Lord Louis Library in Newport. Once the service is satisfied that the new approach is working as expected the equipment will then be extended to Cowes, Freshwater, Sandown and Ventnor in the 2012/2013 financial year.”. “No further redundancies”. Volunteer-run libraries are statutory, says Jeremy Hunt? It is the service (not necessarily the building) is protected by, for example, extending hours in surviving libraries. The Secretary of State sees buildings run by volunteers as an acceptable alternative to council-run service. By far the most important point here is that Mr Hunt seems to be suggesting that the council is still following it’s statutory responsibility if it withdraws funding to certain branches and is successful in getting local people to run them instead. Addition (prompted by comment by Anonymous below): Please note that this view by Mr Hunt is not shared by many others, including in most cases the council’s themselves. If this represents anything other than an attempt to evade the question by Mr Hunt – that is, if it represents evolving Government thinking – then it is very worrying indeed. Q. We receive letters about many issues which your brief covers, as you will appreciate. One of the ones that has generated the most concern at the moment is what is happening to local authorities in terms of library services (JH nods). You have a responsibility … there is the 1964 Public Libraries and Museums Act which requires local authorities to provide a comprehensive and efficient library service which is something presumably that you judge as to whether or not that is happening. Can you tell us what do you think is a comprehensive and efficient library service? Jeremy Hunt. Well, um, the um [looks up to the right] the original definition of comprehensive and efficient came in I believe in something called the Roberts Review of 1959 which preceded the 1964 Public Libraries and Museums Act. That was set up basically to say that comprehensive in that report was really about having a good selection of books at a time when books were more expensive and efficient was actually about reducing the number of library authorities um to reduce um administrative costs um. We take our responsibilities under this Act very very seriously um we um Our basic position is modernisation yes vandalism no um and we have had extensive discussions and engagement with Brent, Lewisham, Somerset, Gloucestershire and the Isle of Wight about their programmes um and it’s probably not appropriate for me to comment in detail on the individual cases because a number of them are going through judicial review proceedings – I think we are going to hear about Somerset and Gloucestershire at the end of this month and I think we are going to hear from the Court of Appeal about Brent next month um The only thing I would say is that you know there are 151 library authorities and um you know around 140 of them are managing to modernise and deal with very difficult cuts in public expenditure without having to have large library closure programmes but by the same merit um what we are here to protect under the ’64 Act I am absolutely clear is not library buildings but library services and I think it is very important that we don’t stand in the way of sensible modernisation but we make sure that um the local authorities really are doing everything they can through their library plans um to see that they are able to maintain good library services. Q. Um Your website says the closure of one or even a small number of library branches does not necessarily breach the 1964 Act [JH nods] and that suggests that the closure of quite a large number almost certainly is. I mean without wishing you to go into details of authorities, you’re aware that a number are making really quite substantial cuts in their library provision. Do you that some without naming names are likely or will potentially breach the Act? A. Well, we are monitoring actually really very closely the whole time um but actually um they’re … you know … if I look at the five authorities that we’ve spoken to … The Isle of Wight looks like it has found um a way for the communities to continue running the five libraries that it has withdrawn funding from. Lewisham, also, is in the process of finding a community-led alternative um and um Somerset and Gloucestershire are trying to do that um Brent has taken a different approach but they’re extending library opening at the weekends um to seven days in the six libraries that they are keeping open um I think it’s not actually about the number of buildings that are being closed. It’s about the availability of the service um and it’s about -going through a proper process and thus satisfying ourselves that local authorities are taking a responsibility for their statutory responsibilities to provide a good library service but this is something that we’re monitoring very closely the whole time. Q. And do you … For the time being at least do you still see the provision of a wide range of actual hard physical things called books a being important? I mean there will come a point when you move as you mention – Ipad revolutionising so many aspects of life where it might become much easier to digitally distribute? JH. Well, I personally have a great emotion attachment to books. I’m sure that all of us do because you know you’re brought up reading books um you think they’re wonderful but um we … I think we have to um accept as the world changes our commitment must be to reading and to people exploring and enjoying literature in a broad sense and we probably will have um increasingly less commitment to an individual way of reading um but I think libraries and library services have a very important part to play in the new digital world as well so I don’t think that’s a reason for not having good libary services. Basically, the old way was pay to keep the library open or close it. Now there is a third way, which is blackmail the local community to do it for free. It is a wonderfully attractive option for councils who are faced with drastic budget reductions and it may well seem better than just closing it, especially if the ideology of the council is pro-Big Society in the first place. It is also better, in the immediate sense, for the community in that at least it still has a library. In the long-term and nationally, though, this third option is a nightmare. Before I go further, I should make clear that I mean no insult to the volunteers involved – they love their libraries, they’re being forced by their love to work intensely hard for it. They deserve, frankly, medals. They’re not doing this for the sheer joy of it. They’re doing it to save their library. Very interestingly, when I asked 40 library campaigners the question “would you want to run your library instead of the council if the council was happy to continue running it themselves?” none said that they would. Frankly, some seemed confused by the question. These are not people filled with a we-hate-council-run-services zeal. Quite the opposite. They love them so much they’re willing to put their lives into it. However, long-term I stick by the statement. Why? It instantly devalues libraries to an “anyone can do it” shelves-with-books on model. It also destroys any semblance of worth to the library profession – if volunteers can do it well, doesn’t that make all librarians basically benefit scroungers, con-people who are being paid for doing a fun hobby? Does anyone actually believe that this is the case? If so, would you mind standing still while I repeatedly datestamp your head? Most importantly, this third way shields the council from fully facing up to the consequence of closing a library. After all, they haven’t. So, they can do it again next year. And again. If a library fails, it’s not their fault. They have a get out of jail free card. If the whole national library service dies in the meantime, it’s not the council’s fault. Jeremy Hunt MP, Secretary of State for Culture, Media and Sport: Annual session with Committee – www.parliament.tv. “The session will be a wide ranging one but issues of current interest likely to be covered include …” [no direct mention of libraries]. In response to an email seen by Public Libraries News, a relevane spokesman responded “The Members of the Committee choose their own questions, but I am certain that they will be asking Mr Hunt about library closures.”. Session to be broadcast live on Parliament TV. Library Campaign Conference – from local to national – Information Overload. Summary of the conference from a librarian / campaigner. March on the DCMS! Open public meeting – Library Campaign. “One of the chief actions to come out of last Saturday’s conference was that we should organise, in February, a national demonstration for public libraries in London, route to include Downing Street and/or the DCMS. One suggestion is that at DCMS, or in Trafalgar Square, we might have a read-in. This is not in opposition to 4 February, 2012, which is National Libraries Day. It could take place later in the month, so that the local activities on 4 February are an opportunity to build for the march.”. National Library Campaign Conference – Walk You Home. “I think it helped to put campaigners in touch with information and resources they can benefit from. It’s hard to get the message out to everyone about what we do in Voices for the Library, the resources we have on the site that might be of use, and the network of people with experience of library campaigning that we can put in touch with each other, so the event and subsequent publicity has helped. At the same time, it can be hard to be obvious about our limits to manage expectations – we’re all volunteers working full time jobs, and Voices isn’t a funded organisation. We can’t save libraries all on our own and we need a national network – which is why the day was organised in the first place!”. Two action points are (1) organise national wiki for campaign groups and (2) arrange a national protest event. Bolton – The five libraries slated for closure have now been made open for groups to take over, business plans need to be with council by 5th December. Central Bedfordshire – Consultation until 18th January 2012. Bolton – Councils throw libraries a lifeline – This is Lancashire. “Volunteer groups are being given the chance to run one of the five closing libraries in the town. Finance chiefs at Bolton Council are inviting people to submit business plans for each of the libraries.Application forms go online today and groups have until December 2 to draft their initial proposals.”. However, groups will need to pay rent and pay for all costs, including in one case £57,000 in repairs. In Northamptonshire, one of the jobs being advertised is “Job Seeker Session Leader”. It’s a post for a volunteer. 17 jobs are being cut by Northamptonshire Libraries by the way, to be replaced by volunteers. In Gloucestershire, on the other hand, the same councillor currently fighting a legal case over its dramatic cuts to the library service, is praising them for getting people online. One hopes this signals the start of a dramatic turnaround by the council. One kind of doubts it though. False Economy is now using the Public Libraries News map database to add library cut details to its site. Soberingly, it has increased its listings of national cuts of all services by a full 10%. “Fantastic visit to Birmingham today. Investing £120m in new central library and modernising library service.” @edvaizey. Department for Culture, Media and Sport. Devon – Extension for Newton Abbot Library. Gloucestershire – County Council and the digital divide – FoGL. “Recent research has shown that four in ten people in the Gloucestershire and Bristol region do not have access to the internet.” … irony is “Cllr Antonia Noble, Cabinet member for libraries, said: “The internet is a great way of getting information. It’s also good fun and makes staying in touch with friends and family really easy.”The county council already supports getting people online through weekly First Click courses in libraries. And around the county, library staff help around 170 people get online every day.”. The council is withdrawing support for ten libraries and drastically cutting funding to others. Northamptonshire – Volunteering in Libraries – Northamptonshire Council. “There are many interesting opportunities for volunteers within the Library service. Details of our current opportunities are listed below.” … jobs include, somewhat ironically, “Job Seeker Session Leader”. Warwickshire – Warwick estate boosted by the return of a mobile library service – Courier. “At the moment there is a case for it. A lot of people living in what is known as a deprived area do want to read a lot of books and I thought it would be a good idea for them to come and have a browse. “It’s something for the betterment of the community.” … described as during the time of a library “cull”. Cambridgeshire councillors (all of the Conservative ones plus one Independent and one Lib Dem. The other 18 Lib Dems voted against) have voted themselves a 25% increase in payments while at the same time cutting front-line services. Being their total remuneration is around £1m, put one way, this increase represents about one-eighth ot the projected £2m cut for libraries in that county. Put another, their pay increase is the same as the cost of twelve small libraries according to their statement that “the local community will be required to provide or pay for the new supervisory staff and contribute towards the building running costs at a suggested figure of £20,000 per library for the 13 smaller libraries in the county.”. Local communities may be wondering why they are being asked to effectively subsidise the pay increases of the councillors who have decided on cutting their library service. One wonders if they will ask for the money to be kept for their libraries in the first place. It seems that Croydon’s brinkmanship threatens the future of Upper Norwood Library (which is generally seen as excellent). Two MPs, including Tessa Jowell, have spoken against it this weekend. Going back in time a year, one can see this problem has a bit of a history. So much so that the TV programme Mock The Week covered it. One wonders how they would cover it today. The % of adults who have volunteered at local libraries has grown 60% in 3 years. This is evidence that, for the 392,000 who volunteered in the last year at least, Libraries are still very much a crucial part of society. Library usage among the best well off in society is in sharp decline. There are plenty of technological reasons for this not least the arriving of the electronic tablets and the great strides in digital archiving. However, these technological benefits have not reached the poor in the same way. Also, of course, people avail of a library for lots of societal reasons (poetry reading, book fairs, debates etc.). And so for both of those reasons, library usage among the worse off in society has held quite steady in recent years and actually marginally increased. Library Usage has been declining in the south of England. This may well be linked to higher economic status or equally the cost of petrol commuting in less urbanised parts of the South East for example. But this has not been the case in the North East. Library usage in the North East of England has held fairly steady in recent years and indeed marginally increased. More than 40% of the North East/West of England still use their library services. In fact, more than 100 million books were borrowed last year. In this parliament alone half a billion books are set to be borrowed. Evidence suggest that the poorer areas of England still benefit enormously from their Library services. Evidence also suggests that people are still willing to give their time free of charge to maintain the library network. New doomed and the dirty past – Bibliothekpolizei (USA). “When I started to work in a public library, I started to meet the people who did not have a computer at home. I met the people who really need the library. I didn’t hang with these “low income” people http://www.gatesfoundation.org/learning/Documents/LowIncome0209.pdf until I worked at a public library.” .. Library worker explains how important libraries are for low income people, from someone who knows. Philip Pullman Speech from Library Campaign Conference – Bambuser #savelibraries. Video from the conference of 22nd October. Taken with a mobile phone so quality is variable. Warwickshire – Harbury and Kineton libraries will not be council-run from March 2012. Harbury volunteers will receive £8k grant in order to seed library/cafe. Kineton will be taken over by parish council for 8 hours per week. Angus – Library laughter and smiles – Forfar Dispatch. “Where’s Wally Day” attracts 60 children. Cambridgeshire – Petition: Stopping the 25% rise in councillor’s allowances – Cambridgeshire County Council. Council wants at least £2m cut in libraries budget. …. massive increases in councillor pay ((e.g. from £22k to £28k basic for council Leader) “in the current context of pay freezes, redundancies and cuts to frontline services including those affecting the least well off and most vulnerable, this is not appropriate”. Councillor remuneration is now nearly £1m per year. Croydon Council terminates Upper Norwood Library agreement – Crystal Palace Magazine. No prior warning to staff. “Croydon’s move is bound to cause absolute uproar in the area.”. Described as a “coup”. Mock the Week have covered Upper Norwood in July 2010. See also Casualties of Croydon Cuts – Inside Croydon (15/7/2010). Northamptonshire – Library launches new service to help people through tough times – Northampton Chronicle. “…an official launch event at the Central Library in Abington Street, Northampton, on Friday for the new library Change! zones, which bring together a collection of titles covering topics such as job seeking, skills improvement, volunteering, financial advice and confidence building.”. This may need to include former library staff as council is going forward with major cuts – £300k cut in staffing costs, with this being made up by including increasing number of volunteers from 400 to 1600. Closer to the reality of Bulkington Community Library – Jonnieb’s blog. Volunteer-run library (supported with money and free building by council) preparations continuing.